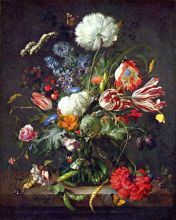 Jan Davidsz de Heem (or Johannes de; c. Apr 17, 1606, Utrecht – before Apr 26, 1684, Antwerp) was a Dutch painter. 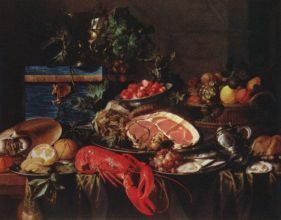 De Heem was one of the greatest painters of still life in the Netherlands, combining a brilliance and harmony of colour along with an accurate rendering of objects: flowers, in all their variety; European and tropical fruits; lobsters and oysters; butterflies and moths; stone and metal; snails and sea shells. Some of his works are displays of abundance; others, only a festoon or a nosegay. Often he would convey a moral or illustrate a motto: a snake lying coiled under grass; a skull on plants in bloom. Gold and silver cups or tankards are suggestive of the vanity of earthly possessions. Salvation is seen allegorically as a chalice amid blossoms, and death as a crucifix in a wreath. 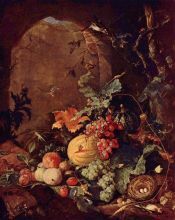 Sometimes de Heem painted, alone or with others, Madonnas or portraits in garlands of fruit or flowers. His signature varied: his initials, or Johannes, or his father's name adjoined to his own. Occasionally he provided a date, especially with his best work. 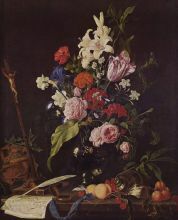 De Heem was born in Utrecht as Johannes van Antwerpen. He studied under Balthasar van der Ast and lived in Leiden from about 1625 to 1629. He entered the painters' guild of Antwerp in 1635 or 1636 and became a burgher of that city in 1637. He remained there until 1667, when he moved back to Utrecht, where records trace his presence from 1668 to 1670. It is not known when he finally returned to Antwerp, but his death is recorded in the guild books of that place. 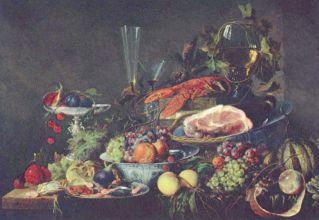 A very early picture, dated 1628, in the gallery of Gotha, bears the signature of Johannes in full and shows de Heem familiar with the technique of the young Aelbert Cuyp. In later years he gained the vigour of his own originality. Of the one hundred or more of his pictures seen in European galleries, scarcely eighteen are dated. The earliest, after the one in Gotha, is a chased tankard with a bottle, a silver cup and a lemon on a marble table, dated 1640, in the museum of Amsterdam. A similar work of 1645, with the addition of fruit, flowers and a distant landscape, is at Longford Castle. A chalice in a wreath, with a radiant bouquet among wheat sheaves, grapes and flowers, is a masterpiece of 1648 in the Belvedere of Vienna. A wreath around a life-sized Madonna, dated 1650, in the museum of Berlin, shows that de Heem could paint brightly and harmoniously on a large scale.